Our Podsacs packs use technical fabrics in a variety of weave and thread diameters (denier) to suit the application. Many of these fabrics have been custom woven to suit the specifications that we require and are not simply bought 'off the shelf'. 1. Cordura® branded high tenacity nylon yarns woven into tough and abrasion resistant fabrics. 2. Durable water resistant (DWR) coating on the outer face of the fabric. 3. High quality PU weather resistant coating on the inside of the fabric in Alpine and Granite packs (Hydrostatic head 20m+). This is coloured light grey to help aid viewing of contents. Bar tacking is used to reinforce all areas which are subject to high loads. We use internal (hidden) bar tacking in many areas which protects this extra stitching from grit and abrasion. All metal buckles, plastic componentry and zips are made to the highest standards. Metal buckles are made from Anodised Aluminium 6061-T6 Alloy, plastic components are all Duraflex branded and zips are all YKK branded. 2. HDPE framesheet to distribute the load to the hipbelt, shoulder straps and top tensioners. 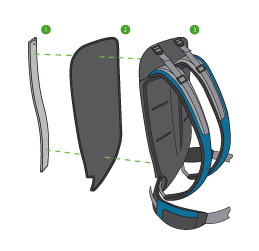 The framesheet also prevents the load from distorting the shape of the pack, or protruding into the users back. Aluminium stave, framesheet and hipbelt can be removed to save weight.